Northeast United FC defeated former champions ATK by a solitary goal in an Indian Super League football fixture at the Saltlake Stadium Thursday. The home side, who kicked off the fifth ISL season with a 0-2 loss to Kerala Blasters, were reduced to 10 players in the 32nd minute when Sena Ralte was sent off for a sloppy challenge. The visitors found the winner through Rowllin Borges from a 89th minute corner by Federico Gallego. It was the Highlanders' first win against the Kolkata franchise from five matches as the win took the Eelco Schattorie-coached side to the top of the table with four points from two matches. ATK still struggled to get off the blocks and they remain at the bottom of the 10 team standings. NEUFC had last beaten ATK way back in October in the 2016 season. 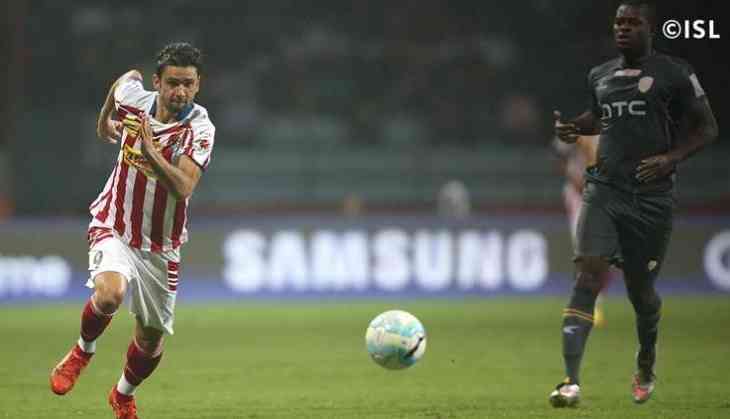 ATK had a brilliant chance in the 52nd minute against the run of play when Noussair floated in his free kick from the left side but Everton Santos flicked it on towards the far post with his head. Captain Manuel Lanzarote got a foot on the ball but TP Rehenesh thwarted the effort. The visitors started the brighter of the two sides with a sweeping move down the left resulting in Federico Gallego finding some space for a shot but Gerson Vieira was on hand to close down the danger. The hosts' first real attacking threat came after some good work by Balwant Singh down the left flank. The India forward set the ball up for Lanzarote but the Spaniard's snapshot was some way off target. Playing with the numerical advantage, the Guwahati franchise nearly struck in the dying minutes of the first half with Bartholomew Ogbeche and Gallego combining well to release Tlang down the left. The winger's low cross across the face of goal found Ogbeche's run but defender John Johnson got a foot to deny the Nigerian.